Pedestrian safety tips for drivers could potentially save a life. In Washington in 2015 a pedestrian or cyclist was involved in a crash every 2 ½ hours and killed in a crash every 4 days. That year there were reported to be 3,590 non-motorist accidents, many of these involving pedestrians. Pedestrian accidents occur more often in cities and urban areas. One way to stay safe when walking in a city is to be sure to obey pedestrian control signals. 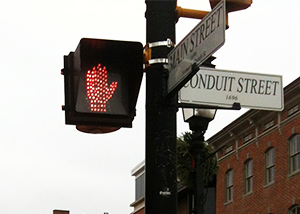 These signals typically have a white “walk” and orange “don’t walk” text or a white walking person symbol and an orange hand symbol. Be sure not to walk when the orange “don’t walk” or the hand symbol. When the don’t walk sign or symbol is flashing, this means to not enter the intersection. There are three age groups most at risk as pedestrians, kids ages 5 to 9, seniors over 65 and persons under the influence. Here are some tips for drivers to avoid hitting a pedestrian. Predict what a child might do. For example, if you see a ball crossing in front of your vehicle, assume a child is going to dart out in front of you to get the ball. Be aware of crosswalks and slow down. Keep a close eye out in parking lots. Be extra cautious when backing out of your driveway. Avoid using your smartphone at all times while driving. Stay alert of pedestrians even at night. Slow down in bad weather conditions. Pedestrians are likely to be in more of a hurry to get out of the rain/snow. RCW 46.61.060: Pedestrian control signals. (1) WALK or walking person symbol—Pedestrians facing such signal may cross the roadway in the direction of the signal. Vehicle operators shall stop for pedestrians who are lawfully moving within the intersection control area on such signal as required by RCW 46.61.235(1). (2) Steady or flashing DON’T WALK or hand symbol—Pedestrians facing such signal shall not enter the roadway. Vehicle operators shall stop for pedestrians who have begun to cross the roadway before the display of either signal as required by RCW 46.61.235(1). (3) Pedestrian control signals having the “Wait” legend in use on August 6, 1965, shall be deemed authorized signals and shall indicate the same as the “Don’t Walk” legend. Whenever such pedestrian control signals are replaced the legend “Wait” shall be replaced by the legend “Don’t Walk” or the hand symbol. If you are injured as a pedestrian, contact the personal injury attorneys at Parke Gordon Law Firm in Spokane to represent you. Let us handle the stress of contacting insurance companies. Our aggressive and experienced lawyers will fight for every penny you are owed. Parke Gordon Law Firm believes every client deserves fair representation, not just big insurance companies with deep pockets. Call our Spokane law office today for a free consultation. This is your opportunity to discuss your pedestrian accident with an experienced and knowledgeable attorney. Call (509) 482-7274 now.